All of the facts that can be gleaned through the news media indicate that the OAS (Organization of American States) is acting irresponsibly. They have called the ousting of former Honduran President Zelaya a “military coup” when the facts clearly indicate that the Honduran Supreme Court ordered the military to remove Zelaya after he insisted on pushing for a referendum that could have removed the current one-term limit for the presidency and allowed him to run for re-election. Mr Zelaya planned to hold a non-binding public consultation on 28 June to ask people whether they supported moves to change the constitution.
. . . tension had been brewing in Honduras over recent months. 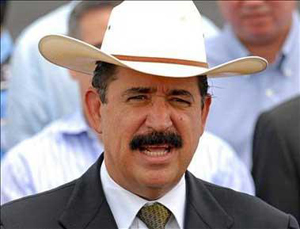 Mr Zelaya sacked the head of the armed forces, who refused to give logistical support for the 28 June vote. The Supreme Court overruled him, saying the army chief should be reinstated. When Mr Zelaya insisted the referendum would go ahead, Congress voted to remove him for what it called “repeated violations of the constitution and the law,” and the Supreme Court said it had ordered the president to be removed from office to protect law and order.
. . . Mr Zelaya, who came to office in 2006, had been moving the country steadily leftwards, enjoying the support of Venezuelan President Hugo Chavez and other left-wing leaders in the region. So we have the Honduran Congress, the Honduran Military, and the Honduran Supreme Court in one corner — doing what they felt was the right thing for the country — and in the opposite corner we have the OAS, Latin American dictators, and almost all the other mostly socialist countries in the world, including our own socialist-leaning president Barack Obama, insisting that the Congress and the Supreme Court of a sovereign country were wrong and should bend to their will. Something about the whole thing stinks. Perhaps it’s Zelaya’s politics. Despite his centre-right credentials, the former businessman moved Honduras away from its traditional ally the US, winning the support of Venezuelan President Hugo Chavez and other leftist leaders. He pledged to tackle gang warfare and poverty in one of Central America’s poorest nations. Publicly backed by such leftists as Mr Chavez, Bolivian President Evo Morales, and former Cuban leader Fidel Castro, Mr Zelaya began to lose the support of his own party. In May 2007, Mr Zelaya ordered all of the country’s TV and radio stations to carry government propaganda for two hours a day, accusing them of giving his government unfair coverage. A plague of unkept promises, a burgeoning relationship with dictators, and then a typical leftist move to stay in power after he would have been removed by the country’s constitution. Thanks Harvey. I wasn’t aware of any of that.